Following the seismic upheavals in the Arab world, Kadir Ateş assesses the situation in Turkey. 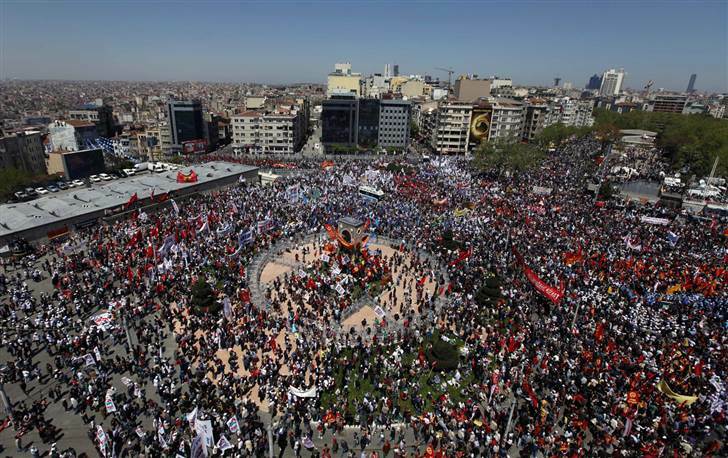 Regardless of the fact that Taksim Square1 did not transform itself into Tahrir Square, there has been a major upswing in labor militancy in the past few years which seems to have no clear end in sight. Reports of yet another strike or demonstration in the past several months have managed to drown out even the more stentorian accolades to Turkey’s successful weathering of the current crisis. This relative success of the Turkish bourgeoisie in maintaining growth was accompanied by a number of legal measures implemented to make labor more “flexible”, suppress the minimum wage, and continue the fire sale of state-owned enterprises. The Tekel strike of 2009-2010 provided the first substantial challenge to the continuous assault against the working class in Turkey, as explained in Issue No. 22 Why the Tekel strike was so remarkable, beyond its militancy—which included hunger strikes, occupations, the formation of a tent commune in the middle of the capital city of Ankara—was the background of the workers themselves. Most closely aligned themselves to the Islamist AK Party (AKP) or the fascist Nationalist Action Party (MHP), and had otherwise been staunch anti-leftists. For the first time, many considered alternative ideas beyond what any of these parties had offered, and the lack of trade unionist support cast doubt over that form of organized labor as well. Yet in the months following the defeat of the Tekel workers, signified in the passing of Article 4/C, new anti-labor laws have been enacted which have in turn provoked the working class to continue its fight. 1. Taksim Square has traditionally been a rally point for activists and protesters on the European side of Istanbul. 2. See Toros Korkmaz and Kadir Ateş, “Lessons from the Tekel strikes: class solidarity and ethnic (in)difference” in Issue No. 2. 3. Zafer Adyin, “Torba yasa, torbadaki sendika , December 12, 2010. 4. Bianet.org, Youth Unemployment in Turkey Twice as High as World Average , August 13, 2010. 5. AKP won with almost 50% of the vote. Interesting article. It would be helpful for the author to explain what the political parties are, in addition to just their acronyms. The three parties mentioned in the article are the three main political parties in Turkey. AKP, an Islamic centre right party, is the Current governing party having won 49.83% of the vote in this years election increasing its vote. It has been in power since 2002. CHP is the main opposition party and took about 25% of the vote in the last elections. It was established by Atatürk in 1919. It is a member of the Socialist International. It is 'Kemalist' and defines itself by the 'six arrows'; republicanism, nationalism, statism, populism, laïcité, and revolutionism. MHP is the smallest of the three main parties. It's roots are in Turkish 'ultra-nationalism'. It is probably most infamous in the West for its youth-wing the 'Grey Wolves. In 1981 they were formally charged with 694 murders. Although it looks all yellow, unlike the UK Turkish electoral have more than one representative. In Ankara for example there are two electoral districts, which elect a total of 31 members of parliament, of which AKP took 17, CHP 10, and MHP 4. Independents essentially means BDP (Peace and democracy party). To win seats in The Turkish parliament as a party, you need to pass a barrier of 10% of the national vote. I previously criticized this article on RevLeft. My comments can be found on this thread if anyone is interested. Essentially I think it completely overestimates the level of class struggle in Turkey at the moment.